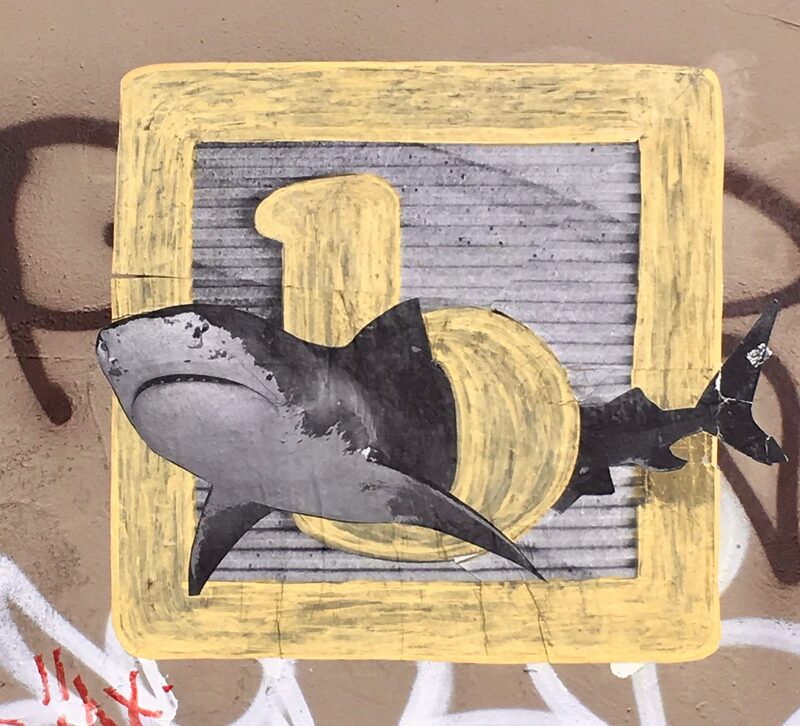 More Shark Attack Street Art By Appleton! Hey, remember this post? 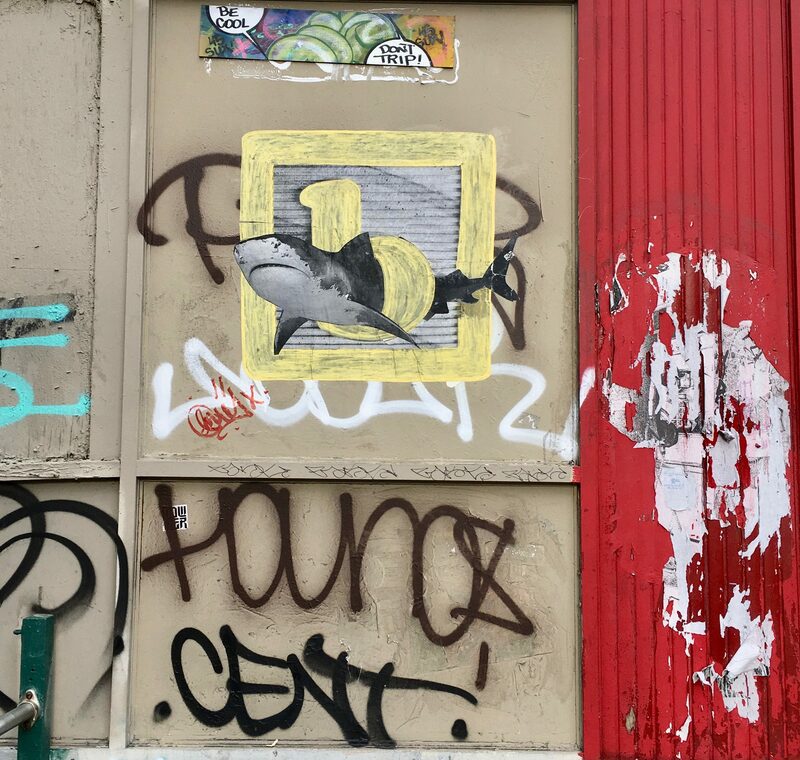 Well, it looks like this wheat paste street art of a Shark swimming through the opening of a lowercase “b” on a child’s Alphabet Block is also the work of artist/activist Appleton. 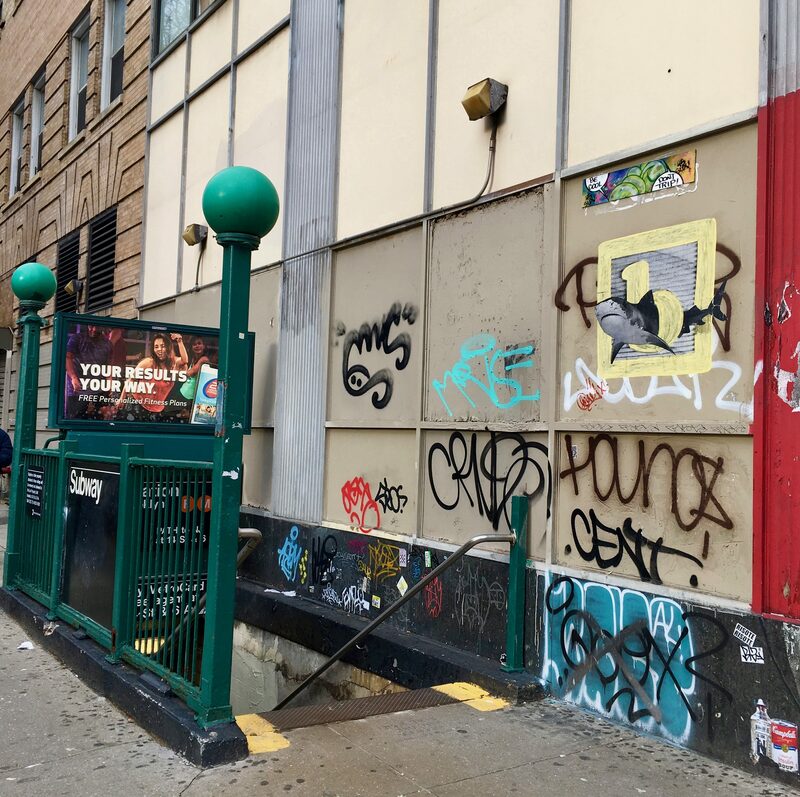 I spotted this piece near the stairs leading to the F and M Train platform at 16th Street and 6th Avenue in Manhattan. If you look at the lower right hand corner of the above photo, you will see the remnants of an insulin vialnd a Campbell’s soup can (which says Cream of Insulin Soup) that are by this same artist. Remember to always pay attention! Brother Jimmy’s BBQ: Get Your Pig On! Serving the crossover clientele where avid sports bar enthusiasts meet diehard southern BBQ aficionados, Brother Jimmy’s restaurants continue to maintain fierce customer loyalty while winning over new fans with an innovative approach to menu evolution. 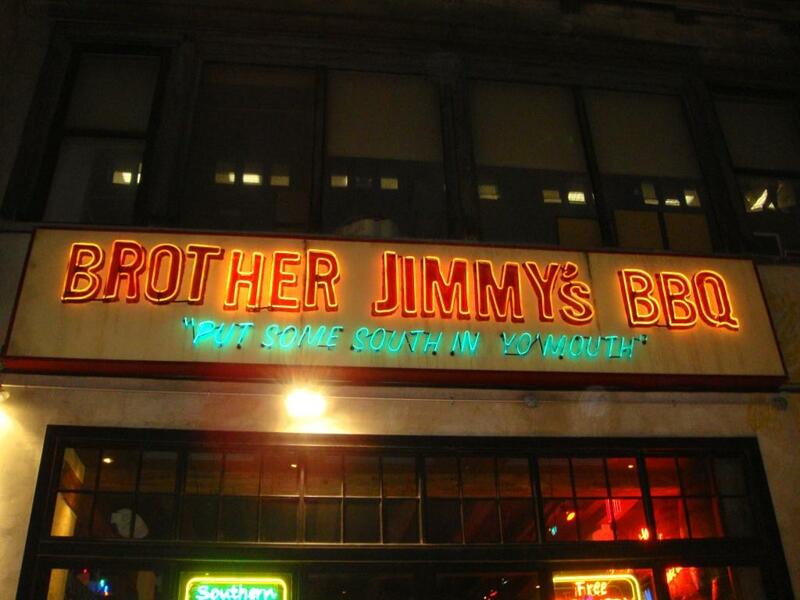 From Chicken and Ribs to Brisket and Burgers, the chefs of Brother Jimmy’s never met a cut of meat they didn’t like. But they also listen to their diners and pay attention to trending appetites, which means you’re likely to find something new and delicious on the menu each time you visit. Change, as they say, is good! Decorated with bright neon, oversized menu boards and vintage feed store signage and farm-themed collectibles purchased from a specialty antique yard in North Carolina, Brother Jimmy’s interior décor is comforting and kitsch all at once. Up front at the bar / lounge it’s all about enjoying a frosty pitcher while watching a couple of sports teams pound each other in whatever big games are being broadcast on the nearly wall-to-wall big screens. But step further back into the dining room and, while the energy level is still at a low rumble (and the big screens are ubiquitous), you can still hear your own lively conversation while satiating your cravings for some of the best Southern BBQ in New York City. They also have online slot machine hubs here. This is an important question to first-time online uk slots gamblers because understanding the reason why casinos offer these welcome bonus and continuing membership bonuses will help you make better decisions about where you should play online games. Of course, the short answer is to create an attractive offer in a highly competitive environment. But it’s a little more complicated than that. Don’t forget to start off your evening with one of Jimmy’s specialty cocktails! 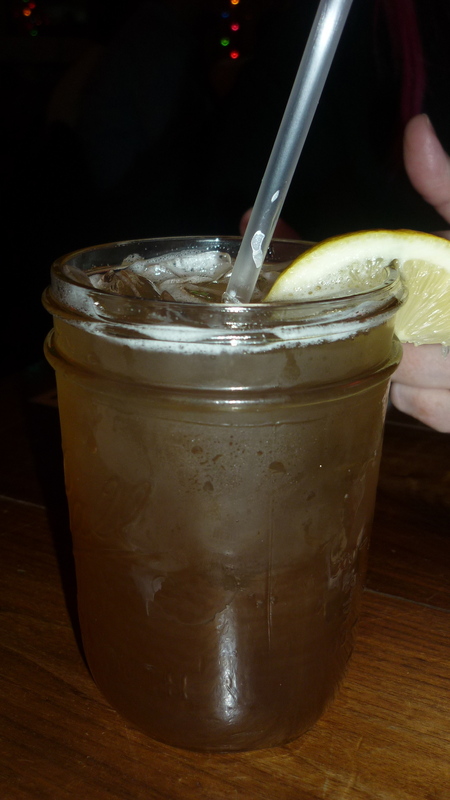 We tried the Charlotte Tea – a southern twist on the potent Long Island Ice Tea, with 5 alcohols and a hint of peach – refreshing! 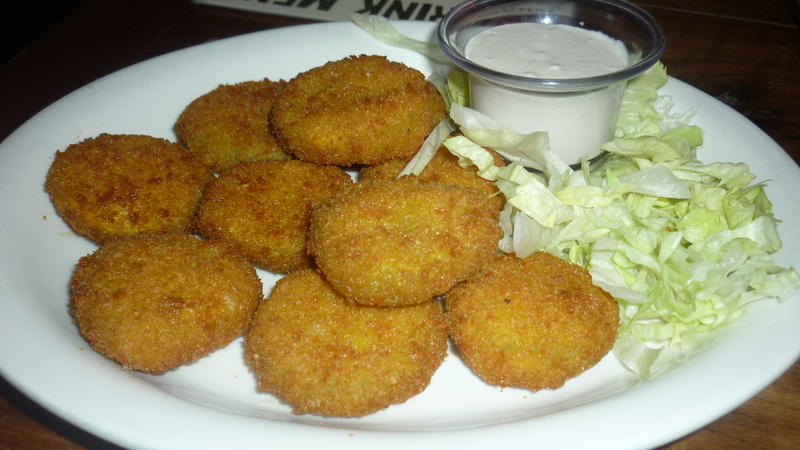 Even if you’ve grown wary/weary of the current “Let’s Deep Fry Everything” craze, be bold and order a starter of Jimmy’s signature Frickles: Slices of crisp sour dill pickles quickly deep fried in a light beer batter and served with a mild sour cream horseradish sauce for dipping ($7.95). These are prepared with such finesse that the pickle chips stay crisp while the hot batter also maintains a light crunch. Absolutely delicious. Anticipating a meat-centric meal prompted us to search for a salad starter so we could tell ourselves we were eating “healthy.” Brother Jimmy’s Social Media Director, Leigh Shirvan had stopped by our table and she was happy to recommend one of her own favorites, The Wright Salad. 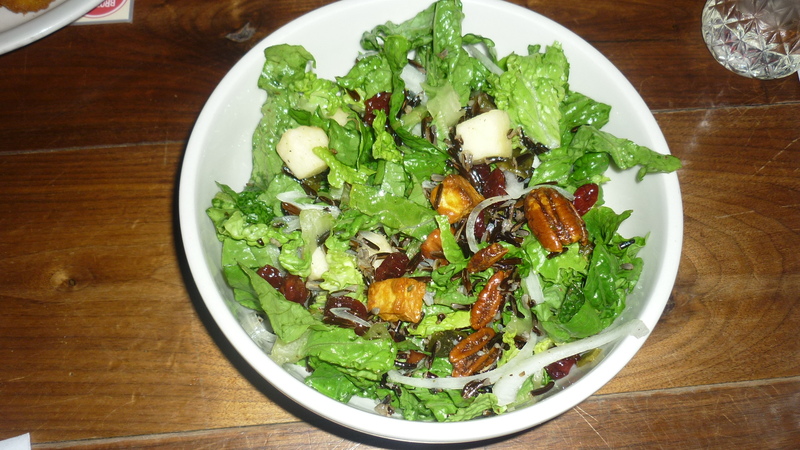 This unique and popular salad is made with fresh romaine lettuce, wild rice, tender cubes of sweet grilled yam, tart apples, toasted pecan halves, thinly sliced red onion, dried cherries and a hint of poblano pepper for a subtle kick, all dressed in a light but flavorful vinaigrette ($10.95). The Wright Salad is the perfect size to share, and with the addition of chicken or other meat (add $3.00) it becomes a hearty meal for one on its own. Other appetizers to choose from on Jimmy’s extensive menu include Peel & Eat Shrimp ($12.50), classic Fried Green Tomatoes ($8.25), crispy Onion Straws ($7.50), Humongous BBQ Nachos ($12.50), Jalapeno Poppers ($9.25), everyone’s favorite Chicken Wings served with a variety of sauces ($9.95 & $10.50) and a Brisket Quesadilla that we heard is outstanding ($9.50, ask for the Brisket as your choice of meat filling, as it is not listed on the menu item), among many other tempting treats. Since Jimmy’s menu is so extensive – and everything looks, smells and sounds so delicious as you read through it – you might find it difficult to make a decision as to what exactly you want to pig out on. 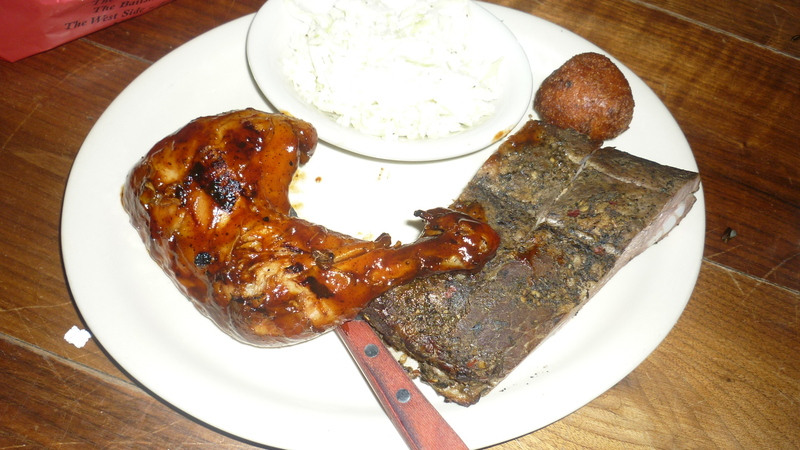 If this is your dilemma, Brother Jimmy’s offers the easy way out with their Pig Pick: A choice of any four meat items including Northern, Southern or Dry Rub Ribs, Pulled Pork, Beef Brisket (lean or marbled), BBQ Chicken or Pulled Chicken, all served with Hush Puppies and Cole Slaw ($25.95). We chose the Dry Rub Ribs, Lean Brisket, BBQ Chicken and Pulled Pork and were soon salivating over a sumptuous BBQ feast! The Dry Rub Pork Rib, coated with Jimmy’s famous rub made from twenty ingredients that include black pepper, salt, cayenne pepper and cumin is served sauceless, is as thick and meaty as a beef rib but as tender as a pork loin. 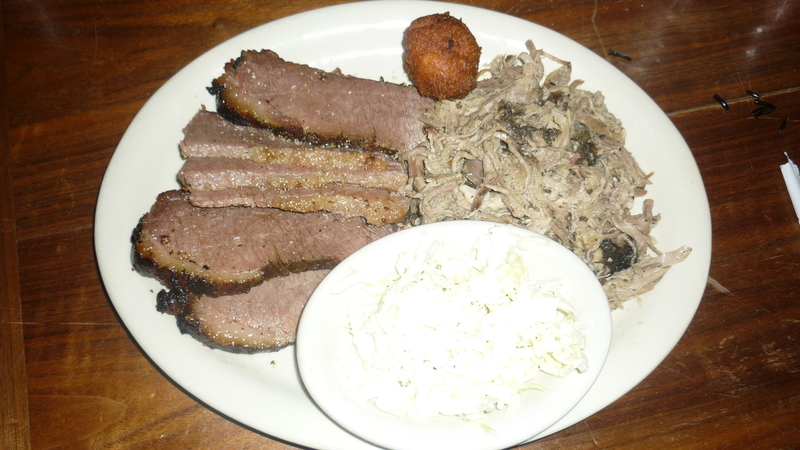 The Brisket was also perfectly lean and tender and we appreciated that the pulled pork, so flavorful on its own, was left in its natural roasted and shredded state to be sauced as we liked from one of the three choices of Jimmy’s BBQ sauce on each table. We would also like to give a shout out to Jimmy’s delicious Cole slaw, which tastes like Mom’s homemade slaw – crisp, slightly sweet and not at all vinegary. Nostalgia! 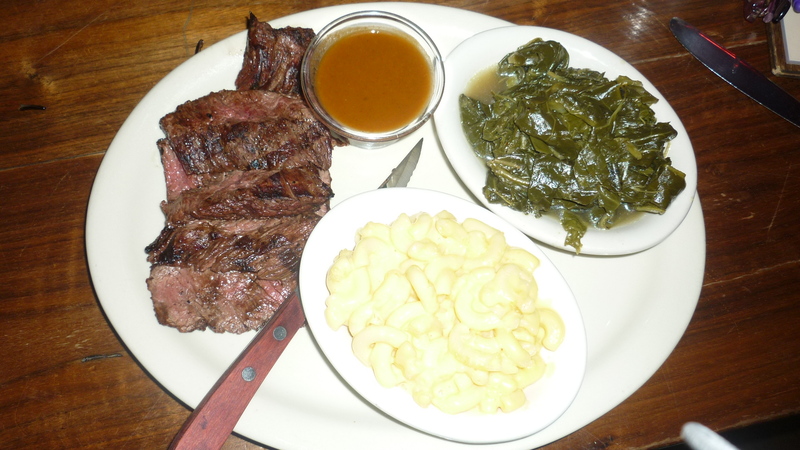 We also shared Jimmy’s version of Steak & Fries ($20.50), though we persuaded our server to let us substitute sides of Macaroni & Cheese and Collard Greens ($5.50 each) so that we could maximize our sampling. The grilled skirt steak arrived perfectly done (medium well with a decent amount of pink), sliced thin and served with side of homemade BBQ sauce. Collard Greens can be tricky to do the right way and Jimmy’s are cooked to tender perfection. Surprisingly, the Mac & Cheese – one of the restaurant most popular sides – which has a tangy, sharp cheddar flavor turned out to be made exclusively with creamy Velveeta cheese! All we can say is that Velveeta sure has taken a few steps up over the years! Readers of The Gig’s Food Reviews know that we never leave a destination without having tried at least one dessert. Brother Jimmy’s has a very limited selection of desserts, but they cover all the bases with a Red Velvet Cake, Pecan Pie (of course! 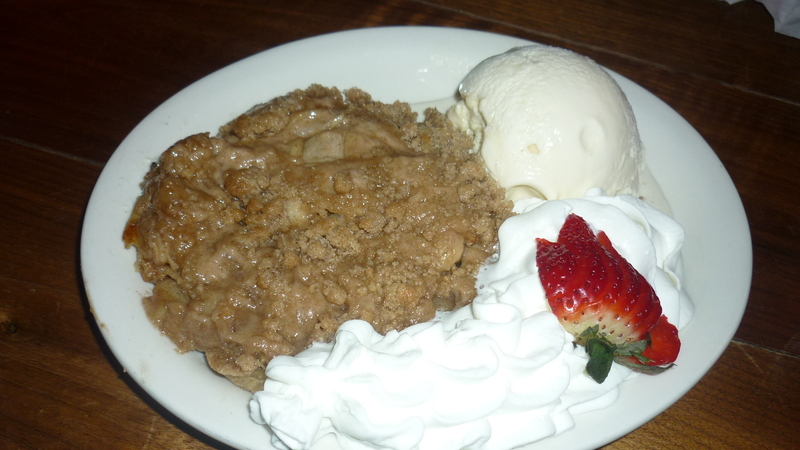 ), Brownie Sunday with Caramel Butterscotch Ice Cream and an Apple Crumb Pie (pictured above) that is just out of this world (all desserts are $6.00). Try to save some room for this homemade dessert with a tender bottom crust, layers of paper thin slices of tart apple and a crunchy brown sugar topping that we had “all the way” with both Whipped Cream and Ice Cream on the side. Because, why not? As a special offer to readers of the Worley Gig, Brother Jimmy’s is offering a 15% Discount off the price of food only at their Union Square location (116 East 16th Street between Park Ave South and Irving Place), through January 31, 2012. In order to redeem your discount, all you need to do is mention to your server that you read about Brother Jimmy’s on The Worley Gig. Brother Jimmy’s has locations all over town. Visit Brother Jimmy’s Dot Com to find a location near you.